STANDING ON THE FRONT STEPS OF MORA (Museum of Russian Art) WHERE I EXHIBITED MY ARTWORK! Many wonderful things happening this year! I was extremely proud to have participated in the "Women's Show +2" Exhibition at MORA (Museum of Russian Art)! It was quite an honor to have my artwork exhibited there! Everyone was very professional in the handling of my artwork for the show and I met many wonderful people at the exhibition! And so my journey as an artist continues.......marvelous things yet to come! First of all I would like to wish all of my wonderful, amazing followers a HAPPY AND HEALTHY NEW YEAR! It has been an amazing and creative past year for me and I hope the same for 2015! I have produced the two magnificent, large scale oil painting masterpieces, "THE RAVEN" and "SACRIFICIAL LAMB", along with a smaller, but equally compelling piece, "LOVE AND DEATH"! These works of art are not only amazing due to my artistic talent and the spiritual meaning behind these works, but also because they were "created" under VERY difficult circumstances. My oil painting, "THE RAVEN" was painted day and night during a horribly cold winter in my freezing basement studio. My oil pastel drawing, "LOVE AND DEATH" was created while I was healing from an injured arm in a terrible fall. 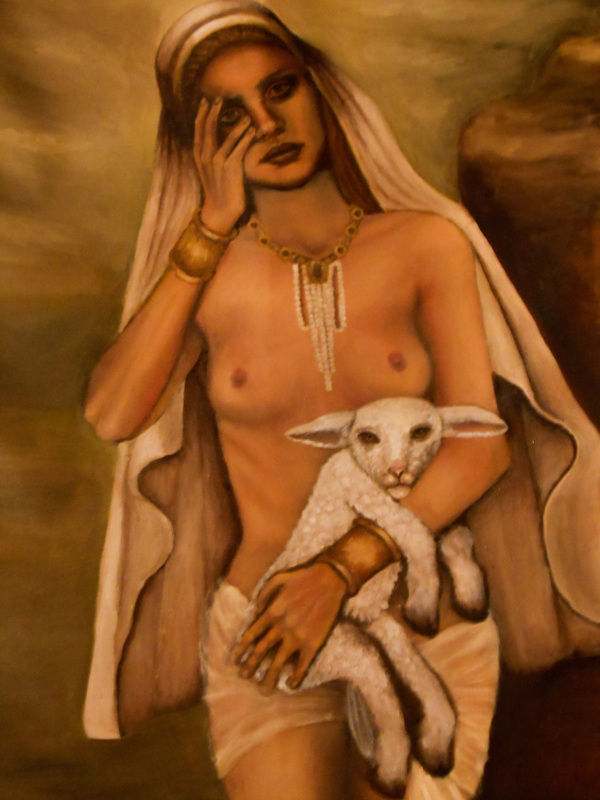 My painting, "SACRIFICIAL LAMB" was created during a period filled with personal problems and conflicts. However, ALL of these works of art were successfully executed and completed. You see a "true" artist will see these obstacles as a challenge to be "overcome" and NOT be "defeated"! Most important, if you have faith in God, he will stand with you and guide you through these obstacles and will be there waiting for you with a smile on his face because he knew all along that you would come out on the other side victorious! GOD BLESS YOU ALL AND STAY TUNED TO THIS WEBSITE! MARVELOUS THINGS YET TO COME! 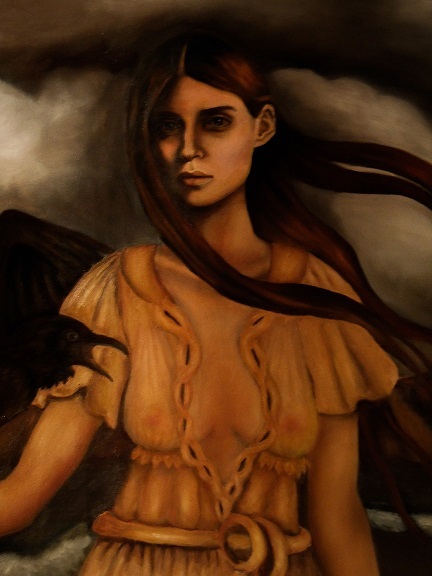 DETAIL, "THE RAVEN", Karen Kroplinski, Oil on Canvas. "LOVE AND DEATH", Karen Kroplinski, Oil Pastel, Colored Pencil, Charcoal, and Graphite on Paper, 18"x24"
DETAIL, "SACRIFICIAL LAMB", Karen Kroplinski, Oil on Canvas. Okay! I have not written for a while and various things have happened in my life since I have last written on this blog! The most exciting thing for me is finishing a piece I call, "LOVE AND DEATH"! The spiritual realm, the physical realm, a separation, a "veil" between these two types of existences and for some that means separation from those we love. 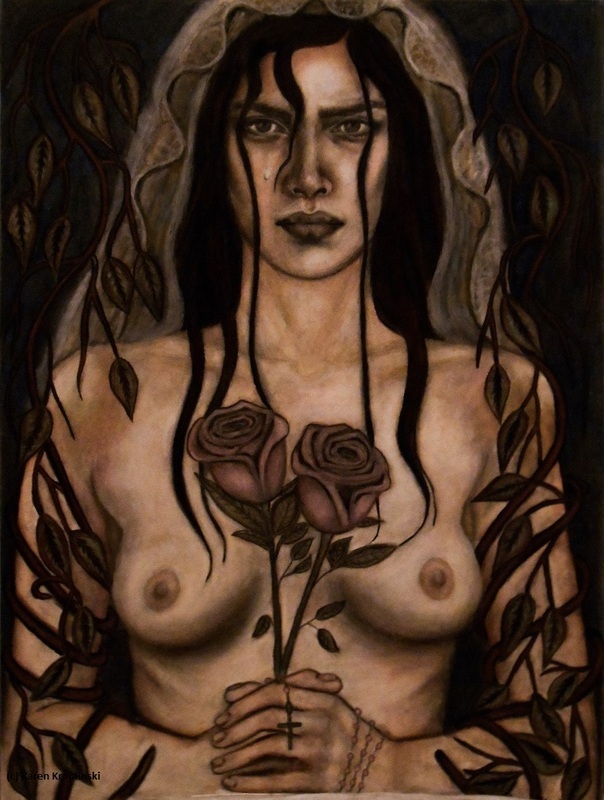 I explore this idea of spirituality and longing for the one we love in this work of art that I call, "LOVE AND DEATH". This separation can be from actual "PHYSICAL DEATH" or the physical "separation" from those we love for ANY reason and the horrible, sad emotion of feeling "bound" and unable to do anything about it. We are in a state of "PHYSICAL" separation from those we love, but a "SPIRITIAL" connection can still remain. Anyway, I am now working on another piece which I am going to call, "SACRIFICIAL LAMB"! SO STAY TUNED! IT IS GOING TO BE A MARVELOUS PIECE! Drawing, "LOVE AND DEATH", Karen Kroplinski, Oil Pastel, Colored Pencil, Charcoal, and Graphite on Paper, 18"x24"
Well, so far this has been an amazing year for both myself and my art! I feel I am making new strides in my artwork and things seem to be coming together for me. My latest oil painting, "THE RAVEN", was completed bundled up in my thermal underwear and pajamas in my extremely cold studio! In my pajamas, of course, because most of the time I liked to paint late in the evening into the early morning and then pass out in my bed! During the night when I paint I can be "ALONE"! COMPLETELY ALONE! This is a necessity when I am painting and meditating a feeling of "spirituality", and becoming completely absorbed in the "process" and in the painting itself. People may not realize the hours and hours each day that an artist can spend working on a piece like this. Also, I enjoy listening to various music while I paint (with earphones of course....at night you see....can't wake anyone!) SO! My painting, "THE RAVEN" is complete and I have already been contemplating and drawing sketches for my next painting! So stay tuned for more paintings and visit my website! MARVELOUS THINGS YET TO COME! It is Christmas Eve and all is right with the world......at least here in my bed tonight! I am relaxing this Christmas Eve into Christmas Day! Watching all the usual Dickens Christmas Carols, the numerous movies depicting Jesus Christ, and I will await a marvelous Christmas Dinner later on Christmas Day with my family! This Christmas holiday has been miraculous as always! And MAGICAL! Going into the various stores and viewing all of the Christmas décor and holiday toys brings me back to the awe and magic of my childhood days and all the precious memories I have had as a child.....picking out a Christmas tree with my dad, drinking hot cocoa afterwards with my dad and brother at the local diner, and the magic of waiting for Santa Claus and not being able to fall asleep! As an adult, I celebrate the birth of Christ.....and I am one with him. So goodnight all, on this Christmas Eve! And hope all of you have a happy, healthy Christmas and New Year! THE ARTIST'S BLOG: Creative Moments andThoughts of the Artist! More miraculous events happening in my life to tell you all about! As many of you already know, I LOVE the sound of church bells ringing from outside my house from the nearby church. Well, today I had to take my mother to the doctors after she came home from the hospital today. She went in there early this morning due to head and neck pain. I managed to drive her to a doctor for follow-up care and was waiting outside in my car for her. TO MY AMAZEMENT, I HEARD THE SOUND OF CHURCH BELLS RINGING LOUD AND CLEAR FROM A CHURCH NEAR THE DOCTORS OFFICE! These church bells ringing is something that has NEVER happened in any place other than my home in all the years I have been driving my mom to the doctors! If you read my post on Saturday, you know that I had seen a vision of Christ in the form of "shadows" from "leaves" on my window shade! I feel that the "CHURCH BELLS RINGING" at the doctors office were ALSO a "SIGN" that GOD is with me and watching out for me and my mom in her time of sickness. It had also been a lovely day today and while waiting in the car for my mother, I enjoyed watching three birds idily circling the sky in their peaceful happiness....no "agenda" just happy being birds and doing what birds do.....FLY! An amazing thing happened when I woke up Saturday morning before taking my mother to the doctors. My mother commented on the casting of shadows from tree leaves on the large window shade in the living room. She asked me if I could see faces in the shadows formed by the leaves and I continued to look until it was obvious that I saw two eyes, a nose, and a mouth....a non-distinct grouping of dot-like shadows that seemed to make up a face. All of the sudden, in the middle of the picture shade, I saw another image of leaf shadows that seemed VERY DISTINCTLY that of a profile image of Christ! I was quite shocked and amazed!. However, I had to quickly get ready to take my mother to an early morning doctor visit, so I was not able to gaze upon this amazing apparition for very long! I don't know what this image was or what it meant, I only know that the shadows of leaves on my window shade.....for a brief period of time....seemed to show an image of Christ and perhaps wanted me to know that he is watching out for me and my mother. Staying up all hours of the night to draw and sketch concepts for new work! I am drawing things that inspire me and I will take it further from there. Sometimes I see not individual people or objects, but rather colors and contrasts that I would like to explore in new oil paintings. At other times it is the feeling or emotion from a person that I wish to relay through my painting. At other times it is a "dream" that I have and I sketch what I saw in my dream and turn it into a work of art. I am considering different concepts and themes for new work. So far I have two new paintings in mind. I will also continue to do the large works that are still in progress as well. I will try to post some sketches of my concepts soon, but still trying to figure out where each piece will go or.....evolve! As all of you can well imagine, I am trying to get my work "out there". I feel that my work is ultimately important enough to be of value both "visually" and "spiritually". Technical merit is indeed important, but that is only one aspect of my art. I feel that art must "say" something or make you "feel" something. If it doesn't, an artist's "technical" achievement means nothing. The "spirituality" in my work is very important to me.....it is what enables me to accomplish each and every piece I do. I hope that each work of art I create will "speak" to you in terms of it's spirituality and make you "feel" something! I am in the process of creating more artwork that I hope you will enjoy! I have not written on this blog in quite a while due to VERY busy blocks of time spent in my studio finishing my latest work, "Eve In Exile, Expulsion From the Garden of Eden", and lately I have been staying up past midnight working on a new piece! I am extremely pleased with my progress, especially in light of the fact that I have accomplished all of this while caring for an ill family member who was hospitalized earlier this year. My work is constantly evolving and developing a style and spirituality that is unique in and of itself. I hope to continue in this evolution and continue to produce works that will inspire you! I am also planning a video of myself in my studio where I will talk about my current work, the spirituality in my painting, and work that I am in the process of developing concepts for. I am looking forward to posting some more work in it's developmental stages on my website soon so stay tuned!